FORT LEONARD WOOD, Mo. (Feb. 4, 2019) — During a ceremony at the Missouri Supreme Court Wednesday, Karen Towns became the first military spouse to be sworn into the Missouri Bar Association under a new rule that creates a pathway for attorney-spouses to practice law while stationed in Missouri. As of Jan. 1, Missouri joined a network of states permitting military-spouse attorneys, whose active-duty service member is stationed within the state, to apply for temporary admission to the Missouri Bar Association without requiring the taking of the bar exam. Towns was sworn in by Missouri Chief Justice Zel Fischer prior to his annual State of the Judiciary address at the state Capitol. During his address, Fischer explained the licensing process to practice law is intentionally designed to be rigorous in order to protect the public, but, the rules on taking the bar exam simply because they relocated with their family needed to be re-evaluated. Rule 8.106, entitled “Temporary Admission for Attorney Spouses of Active Duty Military,” was signed Sept. 5, 2018. “Under the new rule lawyers with licenses in good standing from other jurisdictions, whose spouses are full-time active service members of the United States Armed Forces assigned to a duty station in Missouri or a contiguous state, can apply for temporary admission to practice law in Missouri,” Fischer said. Towns earned her law degree from the University of North Carolina at Chapel Hill in 2001 before marrying now Col. Eric Towns, who is currently the U.S. Army Fort Leonard Wood Garrison commander. They have relocated more than a half dozen times in just under 12 years of marriage. Towns said she is honored to be selected as the first spouse to be sworn in under the new rule and to have Fischer swear her in. “It was an amazing experience, primarily because there was such an outflowing of support for the military community and to be able to experience that first-hand was tremendous and humbling at the same time,” she added. Before Rule 8.106 took effect, attorney-spouse lawyers wishing to practice law in Missouri would have to take the costly bar exam. “It can cost over a $1,000 just to submit the application, that varies from jurisdiction to jurisdiction, and then you need to factor in the cost of bar review study courses. So from a practical stand point, it’s very expensive,” she said. And from a time stand point, Towns said, the process is very time consuming. According to Towns, the process has now been streamlined into submitting an application with background check information and all supporting documents, paying a fee and waiting. She encourages military spouses to continue to strive to reach their career goals. 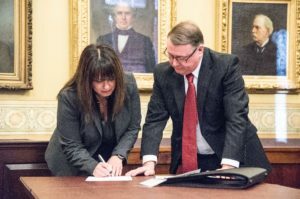 Karen Towns signs her oath of admission prior to being sworn into the Missouri State Bar Association Wednesday by Missouri Chief Justice Zel Fischer (right) under Rule 8.106. She is the first military spouse to be sworn in under the new rule which took effect Jan 1. The rule allows for lawyers, whose spouses are active-duty service members, to apply for temporary admission to practice law in Missouri. Karen is married to Col. Eric Towns, U.S. Army Fort Leonard Wood Garrison commander. Fort Leonard Wood is a thriving and prosperous installation that has evolved from a small basic training post more than 75 years ago to a premier Army Center of Excellence that trains more than 82,000 military and civilians each year. Fort Leonard Wood is home to the U.S Army Maneuver Support Center of Excellence and three U.S. Army schools: the U.S. Army Engineer School; U.S. Army Chemical, Biological, Radiological, and Nuclear School; and the U.S. Army Military Police School. In addition to training engineer, CBRN and military police specialties for the Army, Fort Leonard Wood also provides gender-integrated in-processing and Basic Combat Training for new Soldiers. Fort Leonard Wood also hosts and trains with the largest Marine Corps and Air Force detachments on any Army installation as well as a large Navy construction detachment. More information about Fort Leonard Wood is at: https://home.army.mil/wood/index.php/about/mission.